What makes metal sheds a better option than wooden or other types of sheds? 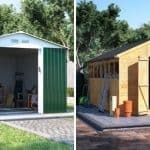 Look into these unique advantages of steel sheds you need to consider. As the popularity of garden sheds began rising in the United Kingdom, debates also formed around which type of garden building offers the best value for its owner. 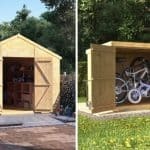 Wooden and metal sheds emerged ahead in this race and they are still the most popular choices for people looking to buy additional storage space for their household. The most significant advantage of steel sheds, is that they are cheaper than their wooden counterparts. For the same price as a timber shed, you can usually get a larger metal storage building. 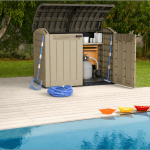 Since budget is a controlling factor in many acquisitions, outdoor metal units are among the most sought-after garden storage options in the UK market. Coming in such a variety of shapes and sizes, they can fit into almost any garden. As a rule of thumb, these storage buildings are delivered in lightweight packages, which makes them easier to fit through a standard door opening. Most suppliers provide metal products flat-packed, meaning you can manipulate them easily around the house or in very cramped gardens. This also mean you can deal with moving an entire shed on your own, which means minimal stress when it actually comes to construction. Lesser weight per package also means that steel storage sheds are much easier to assemble than wooden ones. You don’t have to be a builder to put it all together! All you have to do is follow the instructional leaflet and build up your metal shed. Most often, all the equipment you need to assemble these garden structure comes with the package, so there is no prep work needed, or any additional costs. Metal’s durable feature enables manufacturers and vendors to provide buyers with very long warranties. Ten- to twenty-year warranties are common in the UK, especially when you opt for large metal sheds from renowned manufacturers. The reason why they can afford to provide such a service is that they are aware of the quality and durability of metal. And in order to get the best possible results in the long-run, you should definitely consider buying galvanised steel sheds. If you choose a metal garden building, usually there will be much less maintenance time and budget, or none at all. The galvanised layer underneath, protects the metal from weather elements and prevents the formation of rust. This protective layer also delays the onset of corrosion and reduces its effects on steel sheds. Once every five years or so, you may want to repaint these structures; but, other than that, the occasional hosing down is all the maintenance you have to do! If you have a bigger budget, selecting a metal shed that comes with a metal base is a good strategy. A base will usually include a number of fixings, which allow you to secure the entire structure to the concrete foundation. 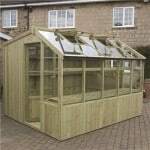 Lighter garden buildings are at times vulnerable to heavy winds that could lift them off the ground. If you anchor your steel sheds to a concrete foundation, you never have to stress over your shed being swept away. Something you should always take into account when choosing a garden building is the fire hazard it can pose to your household. Metal is by its very nature fire retardant and will need extremely high temperature to melt down. You can rest assured that whatever items you have in-stored remain safe at all times. Wooden sheds tend to be much more prone to burning down if exposed to fire and plastic sheds can begin deforming and melting even under low temperatures. Steel sheds usually come with either active or passive built-in ventilation systems. These may include fans and a simple opening in the roof or on the wall. Ventilation is hugely important because it will prevent the buildup of condensation inside your metal garden sheds, therefore protecting your items against any potential damage. Systems that feature fans are even more efficient, but will be more expensive. In terms of security, steel sheds are able to provide increased protection against thieves. Unlike some wooden or quality sheds, the metal ones usually feature reinforced hinges, which help prevent forced entry. The same can be said for the doors and walls. The more money you spend on metal structures, the thicker the hinges, doors and walls are. Each extra centimetre is vital security any thieves or criminals. When it comes to renovations, steel sheds can be easily painted with whatever colour you prefer. If you purchase online, usually you can pick out the colour scheme option before processing your order. Paint coatings are far more resilient on metals than they are on wood. A timber shed will need to be treated and repainted yearly, whereas the metal variety only needs attention every five years or so. 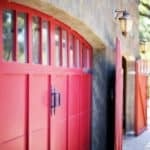 These are just some of the key advantages that metal sheds have over their counterparts. 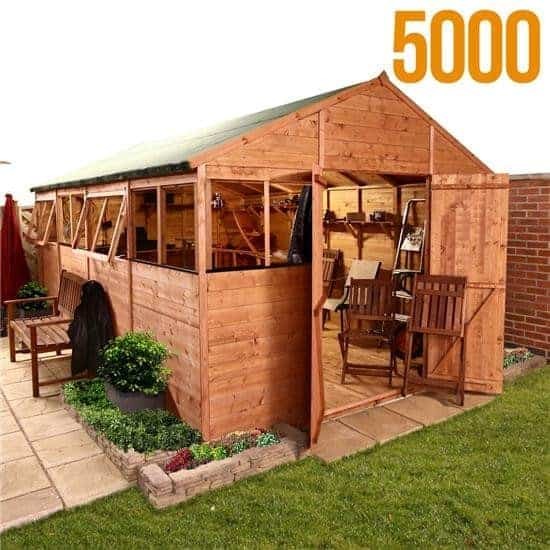 In terms of cost-effectiveness, protection and maintenance, this type of shed never lags behind in giving better value for your money. What do you think of metal shed buildings? Let us know in the comments below. And for more amazing shed information, check out our advanced guide to sheds.